As founders of the Concorde Group of Companies, Irene and Leslie Dubé built a successful business and a reputation for giving back. In 2013, Leslie and Irene Dubé received the Award for Outstanding Philanthropists from the International Association of Fundraising Professionals (AFP). This is the organization’s top honour, and the RUH Foundation knows first hand how well deserved the award is. 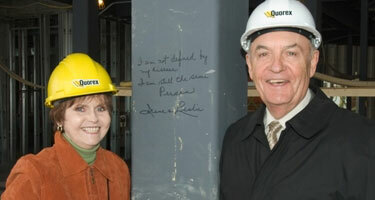 In October 2012, the Royal University Hospital Foundation unveiled the Leslie and Irene Dubé Foundation Intensive Care Unit, formally recognizing the Dubés’ generosity. Their donation purchased 17 vital sign monitors for the newly renovated ICU, and they are making a critical difference every day. Their generosity helped transform the new Intensive Care Unit – Critical Care Unit family waiting rooms for the comfort and care of anxious families and friends. The Irene and Leslie Dubé Centre for Mental Health and Addictions opened its doors at RUH in early 2010, after The Future in Mind Campaign raised $10.8 million for the construction of the centre and the creation of the Community Mental Health Endowment, which funds innovated programs for those living with mental illness in our community. The Dubés donated $3 million—the largest single donation to the RUH Foundation—to advance the treatment of mental illness and addictions in our community.